Established in 1993 during a time when Africa was not viewed as a prime destination for investment, CCA has been critical in facilitating and promoting increased U.S. investment on the continent. Over the last 25 years, CCA has remained dedicated to providing its members with access to key African and U.S. government officials, connections to U.S. and African business leaders and decision makers and insight on the most important issues affecting business on the continent. CCA uniquely represents a broad cross section of member companies from small and medium size businesses to multinationals as well as U.S. and African firms. Its members are invested in Africa's most promising sectors including agribusiness, energy, finance, health, ICT, infrastructure, security, tourism and trade facilitation. On Monday, April 23, 2018 at CCA’s Annual Members Meeting hosted by CCA Member, DLA Piper LLP (US), CCA President and CEO, Florie Liser, emphasized the organization’s continued commitment to advancing U.S.-Africa business and investment. “We are honored to have served as the leading organization solely focused on US-Africa business relations for the past quarter century, and we look forward to continuing to serve as the key resource for U.S. and African companies investing across the continent.” To set an ambitious path forward, CCA is in the process of developing a strategic plan that will ensure that U.S. businesses stay ahead of the curve, as the US-Africa trade and investment relationship continues to evolve. 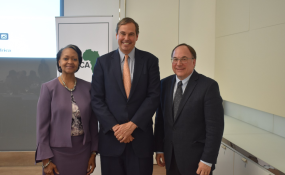 Mr. Ray Washburne, President and CEO of the Overseas Private Investment Corporation (OPIC), delivered the keynote address and led a discussion with CCA members about the administration’s vision and objectives regarding trade and investment opportunities on the continent. “Today, OPIC’s global portfolio is more than $23 billion, and about one quarter of that is invested in Africa.” Mr. Washburne underlined the steps currently being taken within Congress and the Administration to strengthen OPIC. He highlighted the Better Utilization of Investments Leading to Development Act (BUILD Act), which proposes the creation of a consolidated, reformed Development Finance Institution with significantly enhanced resources and tools. The legislation, if passed, will allow OPIC to better support U.S. businesses investing on the continent. CCA will commemorate its 25th anniversary through a series of events and initiatives throughout the course of the year.